Ringer or not, you’re sure to enjoy this 1.25-hour Lord of the Rings air tour led by the aerial film pilot for the movie series. Fly above beautiful Queenstown, and see the spots filmed for the fictional places of Isengard, Amon Hen, Lothlorien, the Misty Mountains, and the Redhorn Pass. See the mountain range from the opening scene of The Lord of the Rings: The Two Towers, and feel like you’re in Middle-earth. Pick up included from all local Queenstown accommodations. 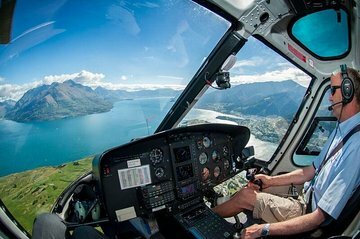 For this 1.25-hour Lord of the Rings air tour, get picked up from your Queenstown hotel before 2p.m., and get shuttled to Glacier Southern Lakes Helicopters on Lucas Place. After you’ve arrived at the airport, listen to a short safety briefing, and then meet your pilot, Alfie Speight. Mr. Speight is the main aerial film pilot for the Lord of the Rings trilogy and The Hobbit. Along the route, he’ll be able to tell you stories about the areas and the filming of the movies. The flight takes two landings, one on Clarke Glacier in Mt. Aspiring National Park and another in Skippers Canyon. Some of the fictional spots you can see during this tour include Isengard, Amon Hen, Lothlorien, Misty Mountains, and the Redhorn Pass. Soar over the mountain range from the opening scene of The Lord of the Rings: The Two Towers, as well as other prime filming locations. Your tour ends back at Glacier Southern Lakes Helicopters where you can take the return shuttle back to your hotel.